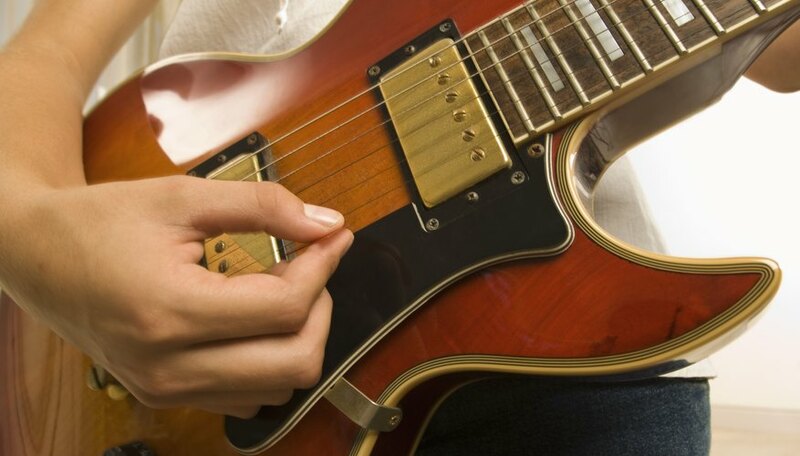 There are several reasons why you may want to make your own pickguard. You may be building your own guitar, or maybe you are customizing a guitar that you already own. The pickguard provides the finishing touch. In choosing to make your own pickguard, you can be as unique or creative as you want. In addition to protecting a guitar and its hardware, the pickguard contributes to the overall appearance of the guitar. Choose a pickguard style. The style of the pickguard depends both upon the guitar and upon your aesthetic preferences. The procedure for making electric and acoustic pickguards is similar, but there are two differences. Pickguards for electric guitars need to take pickups and tone and volume controls into consideration. The second difference is that pickguards are usually glued to the body of the acoustic guitar and screwed into the body of an electric guitar. There are three options for selecting the right style for your guitar; design one yourself, use an old pickguard as a model or buy a pickguard shape. Warmoth Custom Guitar Parts sells pickguard shapes for most styles of Fender and Gibson guitars. The website is warmoth.com. Purchase a pickguard blank. Pickguard blanks are the material that pickguards are made from. Stewart MacDonald is the major seller of pickguard blanks for both acoustic and electric guitars. They provide a variety of materials and colors. The website is stewmac.com. Warmoth also sells pickguard blanks. Trace the pattern on the blank. Secure the pattern on the blank with double adhesive tape. Trace around the edges. If it is for an electric guitar, trace the holes for the pickups and controls. Cut the shape out with a bandsaw. Use a router to make the holes for the pickups and controls and drill the holes for the screws. Make a rough cut with the bandsaw. Smooth the edges out with sandpaper and then use a scraper to bevel the edges. Hold the scraper at a slight angle and bevel the edge until it is about 1/8 of an inch. Don't bevel around the holes for the pickups and controls. Sand the beveled edges with 800 grit sandpaper. Place the pickguard on the guitar and make sure it fits properly. Insert a pen through the screw holes and make a mark. Remove the pickguard. Match the drill bit with the screws and drill the holes. Place the pickguard back on the guitar and secure it with screws. Don't worry about drills and screws if the pickguard is for an acoustic guitar. Simply glue it in place.